Since the Brexit vote, the issue of corporate governance—particularly executive pay—has moved up the political agenda. Although proposals from Theresa May, soon after she became prime minister, to crack down on excessive pay packages and provide worker representation on boards have so far failed to materialise, the general election has brought the issue back into sharp focus. But what is being proposed and how could future legislation affect UK shareholders? The main thrust of the reform proposals is in three main areas: corporate pay, takeovers and employee representation. Theresa May has spoken of her vision of a “different kind of Conservatism” that would tackle what she sees as the excesses of the business elite. 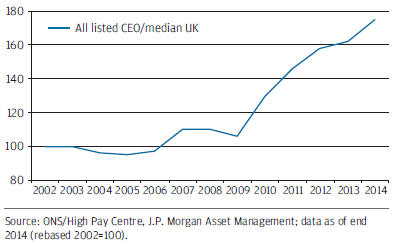 The main concern is executive pay, with remuneration for the average FTSE 100 chief executive increasingly disconnected with both the average worker and, in several cases, corporate performance. As the pay gap widens, fuelling the wider political and social agenda of “out-of-touch” elites, some corporate governance commentators are starting to consider the size of executive pay packages as a social issue, rather than just a corporate governance issue. To tackle the executive pay issue, the Conservatives have pledged to force companies to publish pay ratios between the chief executive and the average worker as part of their annual reports, and to make executive pay packages subject to annual shareholder votes. While the aim of these measures is admirable, achieving success will be difficult. Compelling companies to implement shareholder votes on pay is likely to be the most difficult to achieve. Not least because a binding annual pay vote that acts as a veto on monies already promised, often as part of a pre-agreed employment contract, is fraught with legal difficulty. A more promising option might be a so-called “spill vote”, whereby a company receiving, say, opposition from more than 25% of shareholders in its advisory vote would automatically need to hold a binding vote the following year. However, Australia has tried this approach on share awards and companies immediately found loopholes. Disclosure of pay ratios, meanwhile, is fraught with difficulty and open to gaming, while existing rules have so far failed to curb executive pay. However, disclosure is not without its merits, with a focus on ratios providing shareholders with the information they need to frame a discussion around pay and help them determine how much is simply too much. The takeover of Cadbury by Kraft back in 2010 still casts a long shadow after the US group reneged on promises over factory closures. The Conservatives have pledged to take action against aggressive takeovers, requiring companies to provide clear details of their takeover plans, which will then be legally binding. A Tory government would also extend powers to block foreign takeovers on national security grounds in key industries, such as telecoms, energy and defence. While the Companies Act already states that company directors must always act in the long-term interest of their shareholders and employees, this doesn’t always appear to be the case in regard to mergers, so it could be argued that the threat of legal action may be effective in concentrating minds when it comes to aggressive takeover bids. It can also be argued, however, that a level takeover playing field is something that sets the British market apart and has been central to the UK’s corporate success over the years, despite the risks of continually “selling the family silver”. Whatever the disadvantages, the system does lend itself to a kind of corporate natural selection, and the companies that survive tend to be leaner and fitter, and more competitive. In contrast, it is often argued that protectionism does not work in the long run, as it simply props up companies that ultimately deserve to fail, often at the taxpayers’ expense. The case against protectionism has also been reinforced over the water in France, where newly elected president Emmanuel Macron has confirmed his intention to sell down government stakes in companies. The Conservatives intend to legislate to guarantee worker representation on boards. Companies will be able to choose whether to appoint a director from the workforce, create a formal advisory council made up of employees, or create a non-executive body to represent workers. Employee representation could help support greater worker engagement and boost productivity. However, there is potential for workers’ interests to conflict with management, or for employee board members to be dominated by union representatives, making cost cutting almost impossible. In continental Europe, where the concept is already widely embraced, we often hear from chairmen and chief executives that “the real conversation just happens elsewhere” outside of the boardroom once the employees have left. This is surely not a healthy way to run a company. A more promising option might therefore be along the lines of what happens in the Netherlands, where boards can have employees on them, but from companies other than their own. Thus you get the worker representation and perspective, without the associated baggage and potential for conflict. Perhaps the most striking thing about Theresa May’s proposals is that they all appear to have originated in continental Europe. Binding votes on pay, workers on boards and governments blocking takeovers—all of this sounds very European and, more to the point, exactly the sort of thing the British electorate voted against in the referendum. Or perhaps we are conflating two different things: the desire expressed by many leave voters, on the one hand, to be free of Brussels bureaucracy (albeit that much of the legislation is gold plated by the UK’s very own Whitehall civil servants), and the continuing narrative post-2008 that the Financial Crisis was brought about by greedy bankers and absentee landlord shareholders, who are all out of touch with what is happening outside the City and Westminster bubbles. All of which may be true. Some would argue that we already have at our disposal all the tools we need to express our disapproval of spiralling executive pay. Shareholders can, for example, vote against and ultimately remove remuneration committee members, and indeed there have been examples of this already. “Making it personal” in this way is decidedly un-British, but can be very effective. Perhaps the nuclear option would be to vote out the chief executives themselves, although most sensible portfolio managers would have to think very carefully about the implications for the share price and, by extension, the best economic interests of their clients before making such a move. But it would only take one or two, at the most, to encourage others to join a revolt. Finally, there is the much-touted problem of the global war for talent, or the Premiership footballer argument. If we don’t pay our stars, they will simply up sticks and go somewhere that does. We live in a global world where the US in particular exhibits eye-watering levels of pay that make our own chief executives look decidedly under-remunerated by comparison. Although we do see foreign chief executives at the helm of some of the UK’s largest international companies, executive migration is to my mind overblown. And let us not forget that all western democracies are struggling with the same “out of touch elites” argument, which must ultimately be addressed before it is too late and societies take matters into their own hands. Wayne Rooney would, I suspect, cheerfully play football for a thousand pounds a week if that was the going rate. Rob Hardy is Head of Corporate Governance at J.P. Morgan Asset Management. These views are a personal opinion and therefore may diverge from other views within J.P. Morgan Asset Management.